His promise echoes one made by Liberal Premier George Ross at the start of the 20thcentury as Queen’s Park sought to open New Ontario (as Northeastern Ontario was then known) to settlement and resource extraction. In Ross’s case, however, the mining road was the provincially-owned Temiskaming & Northern Ontario Railway (T&NO, renamed the Ontario Northland in 1946), one of the Ontario government’s first transportation projects. The means of legally extending the government’s reach across this land was through treaty. Ross’s fixation on building a provincially-owned railway was an attempt to prove to the electorate that his government was committed to the economy by opening up the Temiskaming district, which had no railways at the turn of the 20thcentury. At the time, the closest railway to the region was the Canadian Pacific at North Bay, and Ross feared it would siphon off trade as its mainline ran to Montreal and bypassed Toronto altogether. 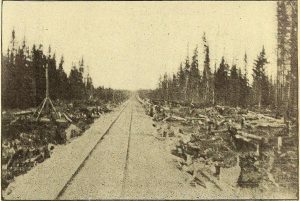 To prevent this, Ross sent ten survey parties to examine possible routes for a new railway stretching as far north as James Bay. The initial survey area was covered by the 1850 Robinson-Huron Treaty between the Crown and local Anishinaabe communities. By 1905, both Toronto and Ottawa were pushing Treaty 9 to ensure clear title for all the land to Hudson Bay – land that would be needed for mining, timber and the T&NO. In their separate work on this treaty, John Long and Alanis Obomsawin have shown how the federal and provincial governments’ deliberate distortion of the treaty process in the early 20th century was a way of accessing these resources by displacing and containing Indigenous inhabitants while also claiming title over the North. It is of the utmost importance that the great commercial centres of Ontario should not be cut off from the advantages which,now more than ever, we believe, can be reaped from the development of our great North Land. If the pine of that country and the pulp should find their way to the markets on Ontario Railways, the sons of Ontario should have facilities on Ontario Railways to enter this land … We are standing at the very gateway of that country, with its vast but undeveloped resources. We should remove every obstacle in the way of trade that is ours naturally and no corporation or other railway interested should be allowed to intercept by discriminating rates or excessive charges, the benefits which would accrue to us if we retained the control which such a railway would give us. A year later, and with an election only a few months away, Ross’s 1902 budget speech named resource development as the central government priority. Ross explained to the House that a modern government “has to be the pioneer … of manufactures and commerce.” To applause, he explained that the timber industry accounted for “nearly one-fourth” of provincial revenue since 1867 and that the mineral deposits in Northern Ontario were “fabulous.” Despite the opposition’s reservations regarding costs and the lack of detailed information presented to the House, James Whitney’s Conservatives (also in election mode) were now behind the railway project. The bill passed in March 1902 and construction began near North Bay later that year. there are large areas of arable land well fitted for settlement and extensive tracts of merchantable pine and other valuable timber, and deposits of ores and minerals which are expected, upon development, to add greatly to the wealth of the Province. The Act proposed that the line would initially stretch from North Bay to Lake Temiskaming and was revised several times over the ensuing decades, granting the railway permission to continue building ever closer to James Bay. The Cobalt silver boom in 1903 and other subsequent mineral discoveries ensured that the T&NO would have customers to serve. In these boom conditions, Ontario (now governed by James Whitney’s Conservatives) relied on the railway to administer town planning in the region while Queen’s Park struggled to process the surge in mining claims. 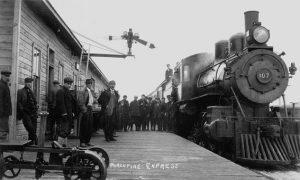 After years of delays, the last spike was finally driven home in 1931 at the Revillon Frères trading post on the Moose River near James Bay. The small community was named Moosonee and remains the northern terminus of the railway today. The T&NO, and later the Ontario Northland, became the only ground transportation link between Moosonee and the rest of Ontario. Still owned by the province today, the railway has been an extension of the provincial government’s colonial power over the land, natural resources and Indigenous communities in Northeastern Ontario. It is in this context that the province is now poised for its biggest mining boom in decades. The so-called Ring of Fire mineral deposits are spread over 5,000 square kilometres to the northwest of Moosonee. The deposits include zinc, copper and roughly 220 million tonnes of chromite, a key component in stainless steel. Estimates peg the potential value of the chromite deposits at over $60 billion. As of 2014, over 30,000 claims had been staked in a frenzy not seen since the Cobalt rush of 1903. If the initial surveys are correct, the Ring of Fire would make Canada the world’s fourth-largest producer of Chromite. Several Canadian and American junior mining companies (including KWG Resources, Noront Resources and Cliffs Natural Resources) have invested heavily in exploration. Meanwhile, Chinese state-owned infrastructure companies have expressed interest in building and operating the required transportation routes to the deposits, but no mining has begun. 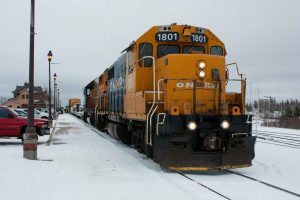 For its part, the Ontario Northland Railway has been largely sidelined in discussions since the Ring of Fire lies hundreds of kilometres from existing railway lines and recent government attempts to sell off the line have worried miners. The Ring of Fire is situated entirely within the boundaries of the 1929 adhesions to Treaty 9 and is the traditional territory of the Mattawa First Nation and several other communities, with Chromite deposits particularly close to the Webequie and Attawapiskat First Nations. In 1905, the exploitative terms of Treaty 9 ensured that mining revenue from Northern Ontario would not be shared with First Nations. More than a century later, the Mattawa First Nation and the Ontario Government have reached an agreement that would secure Indigenous consultation and revenue-sharing in the Ring of Fire development. Whether the agreement will be honoured remains to be seen and some Indigenous leaders are already claiming that they have been pushed aside in the protracted negotiations. When Doug Ford became premier of Ontario in June 2018, his new cabinet raised many eyebrows. Smaller and less diverse than those of recent governments, Ford chose to combine several portfolios in a bid to streamline his administration. Among the mergers was the combination of the Energy, Northern Development and Mines, and Indigenous Relations ministries into a single portfolio. Shortly after, Frank Iacobucci, the province’s negotiator for discussions with First Nations communities in the Ring of Fire was ousted by Ford, throwing the relationship between the government and First Nations into jeopardy. Ford’s actions unwittingly synthesized a century of northern development. Since George Ross vowed to open New Ontario in 1901, the region has existed in provincial eyes as a bastion of resources to be exploited. Following in the footsteps of the miners and lumberjacks was the railway to carry the riches southward. Stuck in the middle were Anishinaabe and Cree communities who had been brushed aside during the construction of the T&NO and Treaty 9 negotiations. The Ontario Northland Railway continues to carry the harvested resources of Northern Ontario to the South and still operates passenger and freight trains to supply the remote communities of the Moosonee area. When Doug Ford echoed the promise of one of his predecessors, he suggested that Ontario’s future may well be Ontario’s past. Some of these ideas were first presented during the Rupert’s Land Colloquium in Grande Prairie, AB, in May 2018. I wish to thank Prof. Heidi Bohaker and my fellow graduate students in the History Department at the University of Toronto for their comments and support. CBC News and Martha Dillman, “Doug Ford Says He’ll Jumpstart the Ring of Fire Even If He Has to Start Building Roads Himself,” CBC, March 16, 2018, https://www.cbc.ca/news/canada/sudbury/doug-ford-northern-ontario-1.4579311. Many books have been written about the railway, but most useful to scholars are Albert Tucker, Steam into Wilderness: Ontario Northland Railway, 1902-1962 (Toronto: Fitzhenry & Whiteside, 1978); Robert J. Surtees, The Northern Connection: Ontario Northland Since 1902 (North York: Captus Press, 1992). Pierre Berton, The Last Spike: The Great Railway, 1881-1885, Anchor Canada paperback edition (Toronto: Anchor Canada, 2001), 280–81; Tucker, Steam into Wilderness, 7–9. John S. Long, Treaty No. 9: Making the Agreement to Share the Land in Far Northern Ontario in 1905 (Montreal & Kingston: McGill-Queen’s University Press, 2010); Alanis Obomsawin, Trick or Treaty? (National Film Board of Canada, 2014). Province of Ontario, “Ontario Newspaper ‘Hansard’ Reel 6,” 22 February 1901. Province of Ontario, Financial Statement of the Hon. Geo. W. Ross, Treasurer of the Province of Ontario (Toronto, 1901), 32–33, http://archive.org/details/ontariobudget1901onta. Province of Ontario, Financial Statement of the Hon. Geo. W. Ross, Treasurer of the Province of Ontario (Toronto, 1902), 4–5, 9, 27–28, http://archive.org/details/ontariobudget1902onta. At least some of the opposition to the bill came from jealous Conservatives who wanted the line to terminate in Mattawa instead of North Bay. Province of Ontario, “Ontario Newspaper ‘Hansard’ Reel 6,” 9 January 1902, 15 January 1902, 27 February 1902, 11 March 1902; Tucker, Steam into Wilderness, 7–10. The Act does not mention the railway reaching James Bay until the 1930s, well after Ontario’s boundaries were finalized. Province of Ontario, “An Act to Authorize the Construction of the Temiskaming and Northern Ontario Railway, 1902” (1902), https://archive.org/details/statutesofprovin1902onta. Surtees, The Northern Connection, 31–42, 174. Josh Hjartarson et al., Beneath the Surface: Uncovering the Economic Potential of Ontario’s Ring of Fire, 2014, 5–6, http://www.deslibris.ca/ID/242243; Ministry of Research and Innovation, “Ring of Fire Lights up Northern Ontario’s Mining Industry,” Ontario Business Report: The Online Journal for Business in Ontario, accessed October 20, 2017, https://web.archive.org/web/20131010002825/http://www.mri.gov.on.ca/obr/?p=1529; Jed Chong, “Resource Development in Canada: A Case Study on the Ring of Fire” (Ottawa: Library of Parliament, 2014), 1, 7. Frank Giorno, “KWG Resources and Chinese Railway Builders Mean Business in the Ring of Fire,” TimminsToday.com, April 11, 2016, https://www.timminstoday.com/local-news/kwg-resources-and-chinese-railway-builders-mean-business-in-the-ring-of-fire-277790. For a detailed examination of the Ontario government’s attempts to sell the Ontario Northland, see Thomas Blampied, Call of the Northland: Riding the Train That Nearly Toppled a Government (Whitby, ON: Northland-Book, 2014). Chong, “A Case Study on the Ring of Fire,” 8. Northern Ontario Business Staff, “‘Secret Side Deals’ Hurt Ring of Fire Progress, Says First Nation Chief,” Northern Ontario Business, November 16, 2017, https://www.northernontariobusiness.com/industry-news/mining/secret-side-deals-hurt-ring-of-fire-progress-says-first-nation-chief-768373. Mike Crawley, “Indigenous Leaders Urge Doug Ford to Keep Separate Minister in New Cabinet,” CBC, June 27, 2018, https://www.cbc.ca/news/canada/toronto/doug-ford-cabinet-minister-indigenous-relations-1.4720758; Philip Lee-Shanok, “How Premier Doug Ford’s Cabinet Choices Reveal Priorities and May Foreshadow Cuts,” CBC, June 30, 2018, https://www.cbc.ca/news/canada/toronto/ontario-premier-doug-ford-s-cabinet-reveals-what-s-important-and-what-s-not-1.4729286. Ian Ross, “What’s the Plan for the Ring of Fire?,” Northern Ontario Business, September 5, 2018, https://www.northernontariobusiness.com/industry-news/mining/whats-the-plan-for-the-ring-of-fire-1037086.